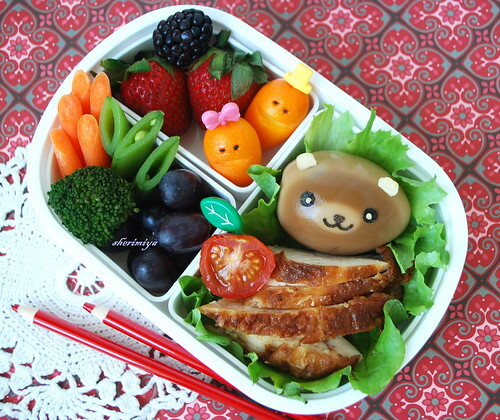 Brown Bear Shoyu Egg Bento, originally uploaded by sherimiya ♥. Today's bento contains the ever-popular kid favorite rotisserie chicken, on a lettuce bed. I made a brown bear from a hard-boiled egg by letting it sit in a small bowl of shoyu. After rolling it around to get even color, let it sit on its side for a few more minutes without moving. You'll see that the spot it's resting on will be a little lighter in color than the rest. I used this spot for the bear's nose. His facial details are cut from nori and satsumaimo (Japanese sweet potato). There's also a cherry tomato half, some kumquats, strawberries, blackberry, grapes, baby carrots, broccoli and peapods. I really like this box too. It's just the right size for my boy's appetite, and all the sections allow me to keep foods and flavors separate. I'm so happy we're starting to see some colorful fruits and vegetables in the markets. I'm hoping my bento get more and more colorful as a result, as the season goes on... how about you? Another cutey pie bento! Love the technique for the bear. Wow so many details and different flavors! I love what you did with the kumquats! Thanks Token: yes, my specialty is trying to make the most out of the least...so you know if I can make it, you can do it easily too :) Thanks a lot! Hi bentobird; our farmers market is open year-round, but with the pickings much slimmer this time of year...so I am looking forward to next season as much as you! Thanks a lot! Awww, I love the bear and the kumquat people make me laugh! Wonderful bento! Aw, thanks a lot rainnykwan!! Hawaii's Bento Box Cookbook ~ A Giveaway!